This Item is a Pre-Order and will arrive on: Tuesday August 27th 2019 ! APR192532 - A Diamond Select Toys release! 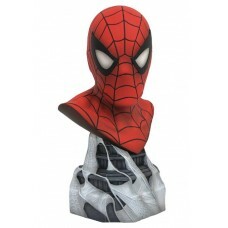 Spider-Man is an icon of the Marvel Universe, so DST is celebrating his legendary status with a Legends in 3D bust! Measuring approximately 10 inches tall, this half-scale resin bust features incredible detail that's almost as large as life. Limited to only 1000 pieces, the bust comes packaged with a certificate of authenticity in a full-color hand-numbered box. Designed by Joe Allard, sculpted by Joe Menna.